Fire shuts down major Chevron oil refinery in northern Calif. Residents living near Richmond, California, are being told to stay inside and shut their windows after a fire erupted at a Chevron oil refinery. NBCNews.com's Dara Brown reports. Updated at 8:05 a.m. ET: A massive fire struck at the core of Chevron's large Richmond, Calif., refinery on Monday, spewing flames and a column of smoke into the air, and threatening a prolonged outage that may increase prices of U.S. gasoline. The fire was contained by 11 p.m. (2 a.m. ET), according to the company. The fire blazed for hours after it erupted at the refinery in a densely populated industrial suburb east of San Francisco. Smoke could be seen billowing over the Bay Area and four train stations were shut. Thousands of local residents were ordered to stay indoors and shut all windows and doors after the fire hit the sole crude unit at the 245,000 barrel per day plant, which accounts for one-eighth of California state's refining capacity. But that order was later lifted. "I heard a big boom ... then the alarms started going off," 23-year-old local resident Daniela Rodriguez told the Contra Costa Times. "I was getting kind of scared. I went into my backyard and could see a big, dark gray cloud. I saw it was coming from where the refinery is, so I told my mom to lock the windows," the newspaper quoted her as saying. The plume from the fire reached an estimated 3,000 to 4,000 feet above ground level, officials said at a news conference, according to the Times. All workers had been accounted for and no fatalities were reported, but one employee was treated at an on-site clinic for burns to his wrist, the San Francisco Chronicle said. About 200 people have sought medical help, complaining of respiratory problems, the San Pablo, Calif.-based Doctors Medical Center said in a statement. "They told me I'm not going to die, but it sure feels pretty serious," 21-year-old Richmond resident Julius Bailey told the Chronicle after seeing a doctor for respiratory complaints at Kaiser’s Richmond Medical Center. The fire had started in the No. 4 crude unit, the only one at the plant, at 6:15 p.m. shortly after a leak was discovered, Chevron said. As the leak grew, workers were evacuated, plant manager Nigel Hearn told journalists at the site. He said some units were still operating, but gave no details. Any lengthy disruption in production could affect the supply of fuel in the West Coast, particularly gasoline, due to the difficulty in meeting California's super-clean specifications. The region also has few immediate alternative supply sources. "Chevron will have a hard time finding replacement barrels in an already short market," said Bob van der Valk, a petroleum industry analyst in Terry, Mont. "Refineries are already drawing down summer blend inventory in anticipation of the switch back to winter blend gasoline," he said. 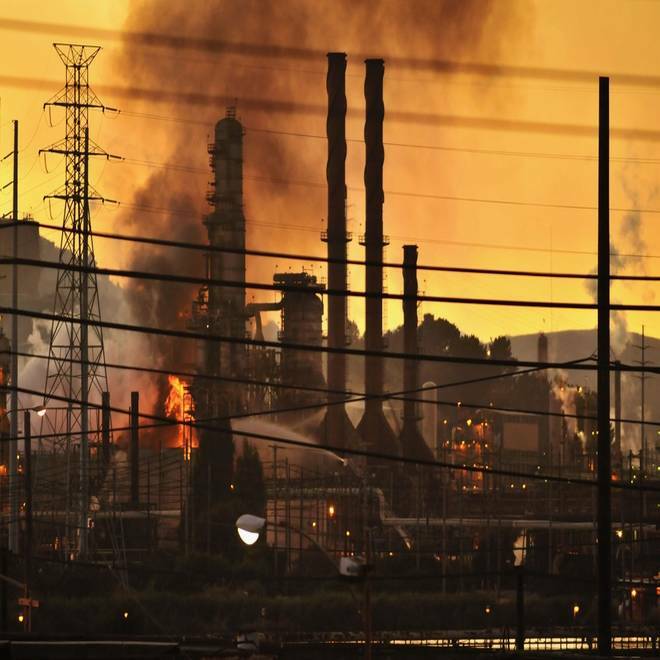 Residents of Richmond were advised to "shelter in place", an order often given during refinery accidents to shield against possible exposure to toxic chemicals or smoke. Sulfuric acid and nitrogen dioxide were released during the incident, according to a filing with the California Emergency Management Agency. "We heard the sirens go off and I said, 'Thunderdome blew,'" Richmond resident Emmett Zediker told the Times. Firefighters douse flames at the Chevron oil refinery in in Richmond, Calif., on Monday. "We call Chevron 'Thunderdome' because when it blows, it blows. So we cracked open a bottle of vintage wine and we are having an apocalypse party," the Times quoted him as saying. The refinery, the third-largest in California and among the oldest in the country, is key to the economy of Richmond, a declining industrial city. But it has stirred controversy among local residents concerned about the environmental impacts and local politicians often seeking more tax revenues. "I looked out the window and saw 40 foot flames and black smoke," Marc Mowrey, a Point Richmond resident who lives about a mile from the plant, said in a telephone interview. He said the smell was not exceptional or very different from other days, but a huge plume of smoke was sitting over Richmond and neighboring El Cerrito. At its peak 10 years ago, the refinery employed over 1,300 people on a site of over 2,900 acres. Last week, the refinery reported vapor leaks and a compressor failure to California pollution regulators, according to notices. The notices did not say which units were involved. We are "very disappointed that this happened, and apologize that we are inconveniencing our neighbors," Chevron spokesman Walt Gill told local television. A Reuters reporter who lives nearby said he heard some loud bangs and a siren as the fire erupted, but a Chevron spokesman denied reports of an explosion. In 2006, an explosion at the plant sent hundreds of people to the hospital. Incidents also occurred in 1999 and 2007. It is common to shut down the entire plant in the event of a major blaze. A Feb. 17 fire at the crude installation units of BP's 225,000-bpd Cherry Point, Wash., refinery led to a three-month shutdown and sent the regional price premium to more than $1 a gallon in some places. Reuters and NBC News staff contributed to this report.